Check out this latest trend that is working out for both male and females! (Side note : I live in Miami and I am obsessed with boots in this hot weather. 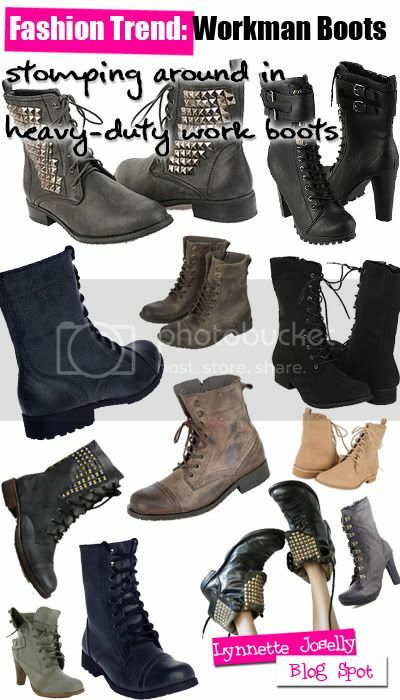 )Workman boots, combat boots, military boots, or what ever else you would like to call them, they have been trending this Fall/ Winter. Obviously the most popular color is black because they match with anything and everything but branch out to other earthly tone colors such as brown and beige. For males it is all about the rugged look. These workman boots are no longer used just for heavy duty work days. It has expanded beyond the "gothic" look into a more "street" sense of fashion. One needs to be stylish and daring to pull of this look. These type of boots are pretty durable and have a tough texture. Now for females, the flat boots have a more androgynous look to them but can be paired off with girly clothing such as a floral skirt to look more stylish and chic. If the flat boots are too masculine for you, try them out with heels for a more feminine touch. This can also include the lace up boots that were worn during the Victorian era. However, these boots were always hidden under layers of billowy skirts. It is now the time to show them off. So be sure to sink your feet in this season's latest trend.